Karel Špillar (1871-1939), Breton Fisherman with Seaweed on his Back (1931), further details not known. Wikimedia Commons. Humans have probably harvested and used seaweed ever since they started to live on the coast. One of the few ‘crops’ confined to the coast, seaweed is a distinctive feature of Japanese cuisine, now popular worldwide in sushi, for instance. In the past, seaweed was used extensively in coastal areas to fertilise the land, most commonly in agricultural systems which built raised beds with seaweed, known as lazy beds, also as run rig and rundale. It has been eaten in many different parts of the world: in Japan, the type most widely-used in the kitchen is Porphyra, which is made into thin sheets; in Wales, it is blended with oats to make laverbread. 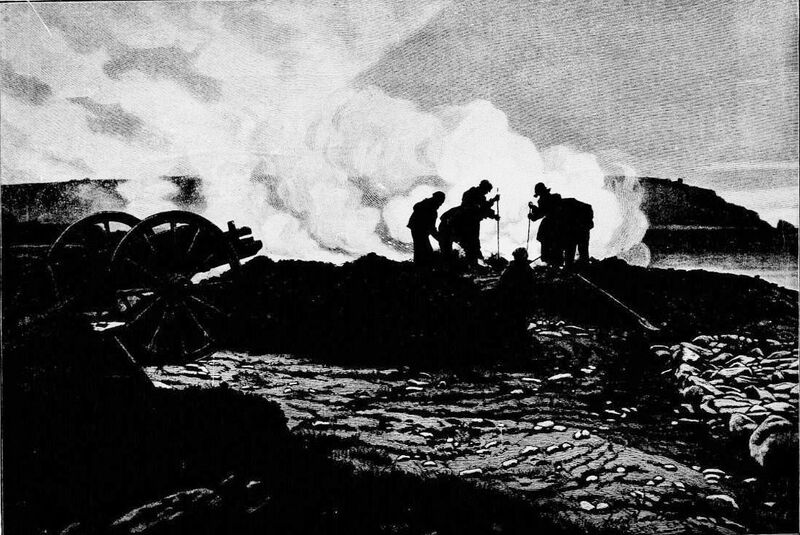 During the European wars of the late eighteenth and nineteenth centuries, seaweed was harvested and burned to make ash which was processed to yield saltpetre, a vital ingredient in the production of gunpowder. Most recently, alginates, agar and carrageenan have been extracted and used widely as food additives and even for dentistry. The seaweed industry has come and gone in many coastal areas, but during the nineteenth and early twentieth centuries was featured in paintings of Britanny in particular. James George Philp (1816-1885), Kelp Gatherers (date not known), watercolour, further details not known. Wikimedia Commons. 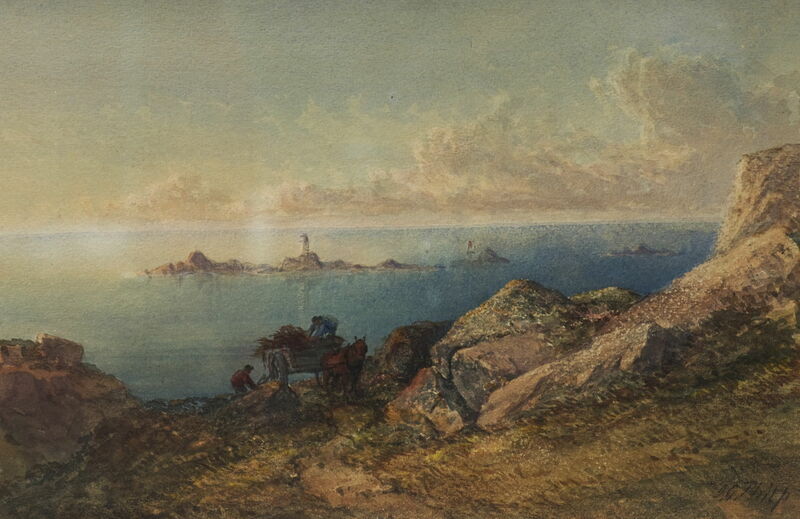 James George Philp’s watercolour of Kelp Gatherers shows a pony-cart being loaded with seaweed on the coast of Cornwall, on a fine and calm day, probably between 1850-80. Philp was a local artist whose watercolours helped awaken interest in the coast of Devon and Cornwall, when he exhibited those paintings in London. As artists started to flock to Brittany in the late nineteenth century, they saw the seaweed harvesting and processing industries at first hand. When Georges Clairin visited the extreme western promontory of the peninsula, he painted Kelp-burning at the Pointe du Raz (1882). Teams, largely of women, descended the cliffs when the tide was low, to gather seaweed onto the narrow beach (left). They loaded the seaweed into baskets which were then raised using winches at the top of the cliffs (centre), and the harvest taken behind a massive dry-stone wall for burning (right and in the distance). The ashes were then gathered up and taken off in carts, for sale. Clement Nye Swift (1846-1918), Harvesters of Seaweed (c 1870-80), further details not known. Wikimedia Commons. During the decade in which the American painter Clement Nye Swift spent in Brittany, he painted Harvesters of Seaweed showing a team of oxen being driven along a beach, towing a heavy load of seaweed. Howard Russell Butler (1856-1934), Kelp Gatherers (1886), media and dimensions not known, Smithsonian Institution, Washington, DC. Wikimedia Commons. Another American artist, Howard Russell Butler, stayed near Concarneau on the southern (Bay of Biscay) coast of Brittany, where he painted Kelp Gatherers (1886). Butler lived in Paris between 1885-87, and like many American artists there at the time was encouraged to paint in Brittany. He became well-known for his paintings of the 1918 solar eclipse in Oregon. It was the arrival of Paul Gauguin, and the formation of his circle, in Brittany which resulted in some of the best-known paintings of the seaweed harvest. Paul Gauguin (1848–1903), Seaweed Gatherers I (1888-90), gouache and graphite on grey board, 27.6 × 32.4 cm, Private collection. Wikimedia Commons. 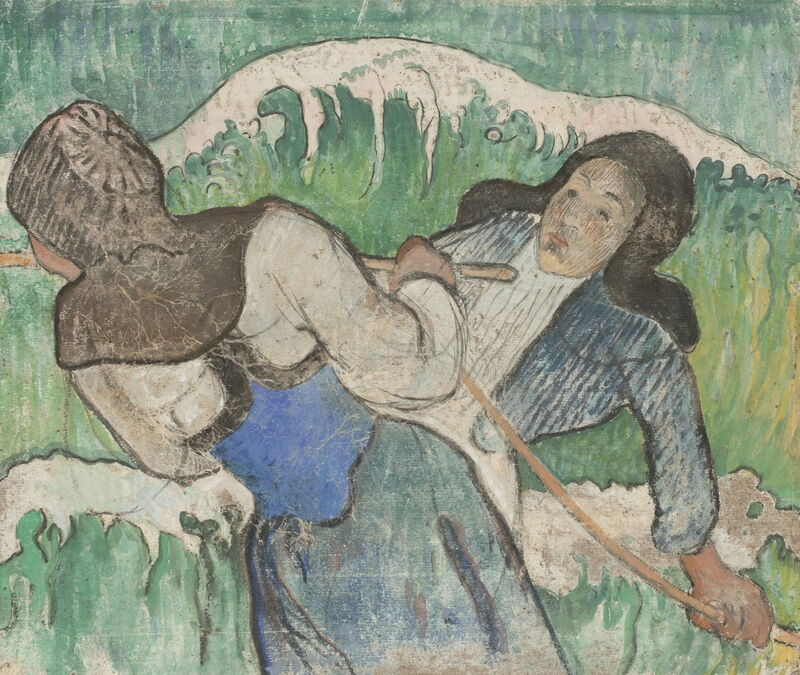 Gauguin’s gouache Seaweed Gatherers I (1888-90) shows two Breton women gathering seaweed on the beach. Behind them is a huge wave, its spume formed into a claw, which is strongly reminiscent of Hokusai’s ukiyo-e print of The Great Wave off Kanagawa (c 1829-32). Paul Gauguin (1848–1903), Seaweed Gatherers II (1889), oil on canvas, 87 x 123.1 cm, Museum Folkwang, Essen, Germany. Wikimedia Commons. His Seaweed Gatherers II (1889) is in complete contrast: the sea is now flat calm, and a team of women are carrying large piles of seaweed up the beach, ready to load into carts. Émile Schuffenecker (1851–1934), Seaweed Gatherers (1889), oil on canvas, 82 x 66 cm, Private collection. Wikimedia Commons. At the time, Émile Schuffenecker was a close friend of Gauguin. Schuffenecker’s Seaweed Gatherers (1889) shows another characteristic sight, a stream of women carrying heaps of seaweed on their back. I apologise for the poor quality of this image. Émile Bernard (1868–1941), Breton Women with Seaweed (c 1892), oil on canvas, 80.8 x 65.8 cm, Indianapolis Museum of Art, Indianapolis, IN. Wikimedia Commons. 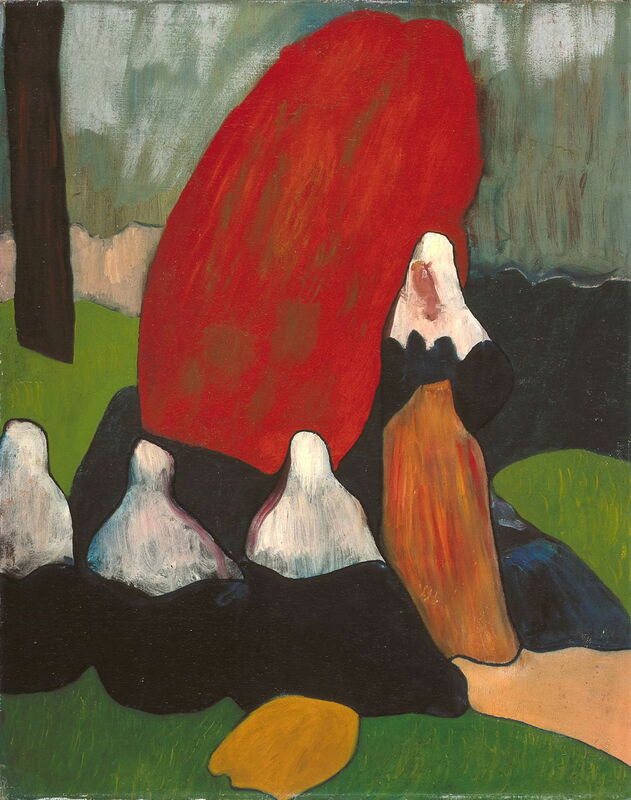 Émile Bernard made friends with Gauguin when they met in Brittany. 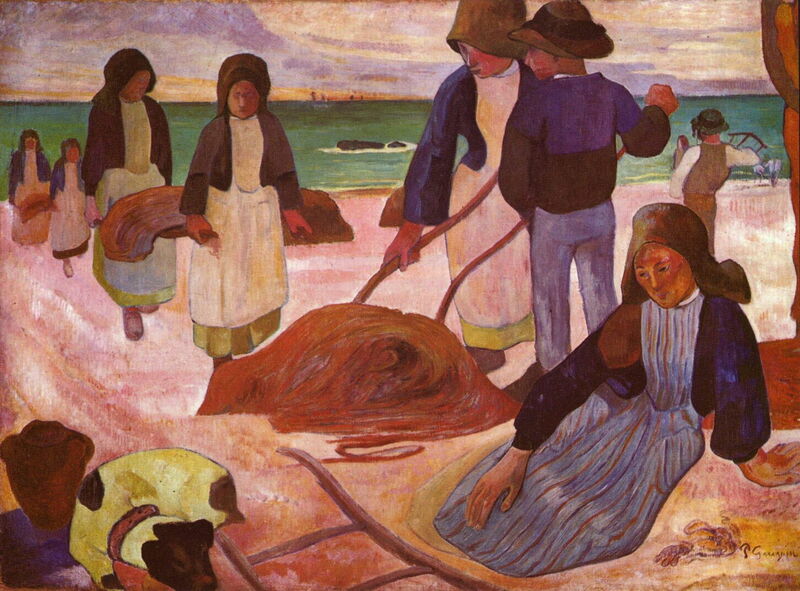 Bernard’s Breton Women with Seaweed (c 1892) shows his later and more radical style. Four women, who appear like nuns, are in front of a high stack of bright red seaweed, which they have presumably gathered there to dry. Henry Moret (1856–1913), Seaweed Gatherers at Moëlan (1889? ), further details not known. Wikimedia Commons. 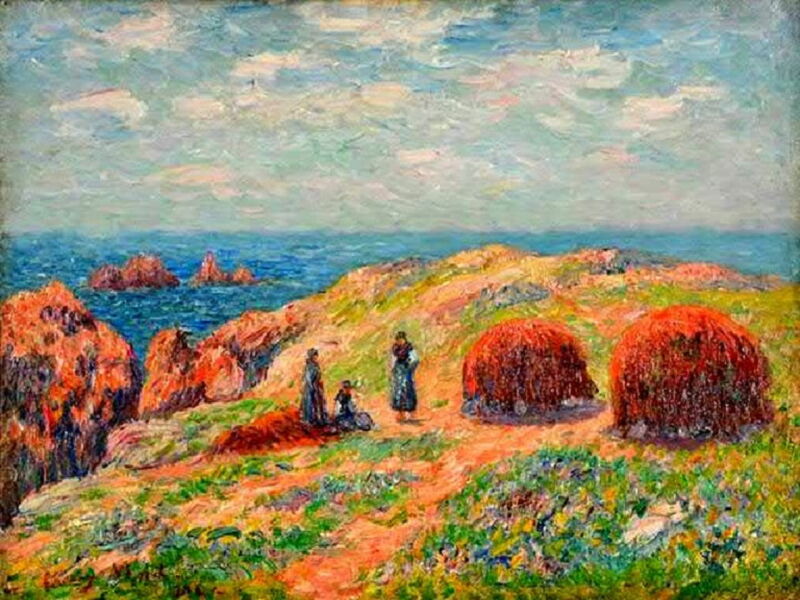 Henry Moret’s Seaweed Gatherers at Moëlan (1889?) 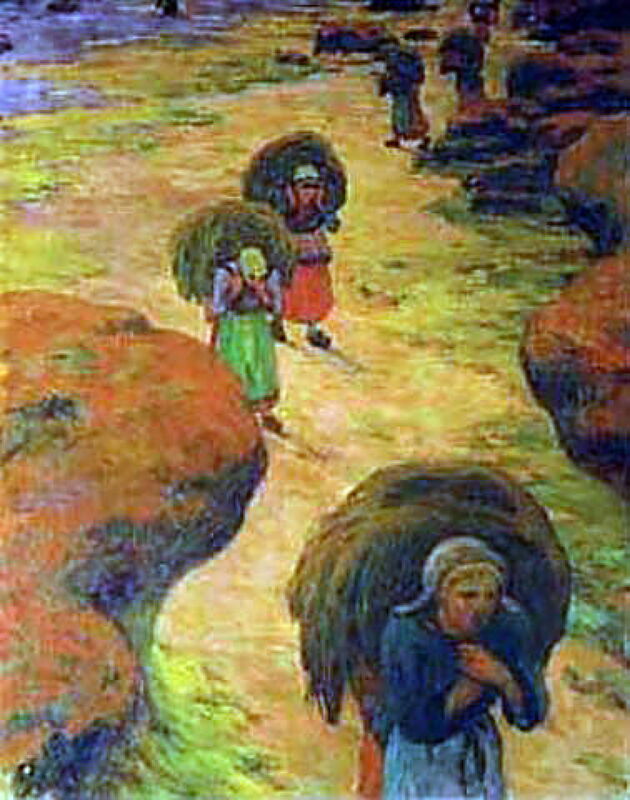 shows a more distant group of four Breton women gathered at another, even larger stack of seaweed, at the top of cliffs to the south of Pont-Aven. Henry Moret (1856–1913), Cliffs at Ouessant (1902), oil on canvas, 46 x 61 cm, location not known. Wikimedia Commons. 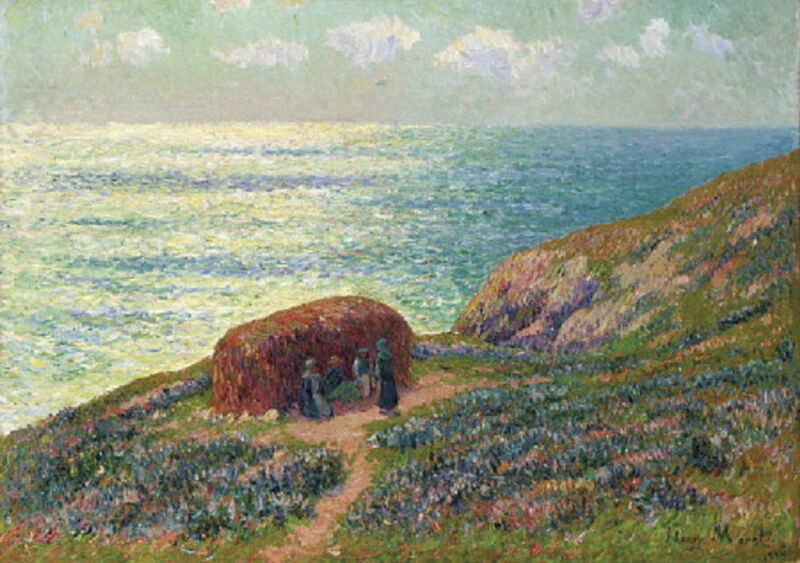 Moret’s Cliffs at Ouessant (1902) shows a similar sight on the island of Ushant, the small and rugged island off the western tip of the Breton peninsula. With a population of less than a thousand, its major industry at the time was fishing, and the seaweed was used as a fertiliser to support its limited subsistence farming. J Lavée (dates not known), Ouessant, Seaweed Burners in 1898 (c 1898), illustration in ‘Ouessant, Enez Heussa, l’île de l’Epouvante’ by Paul Gruyer, 1898, further details not known. Wikimedia Commons. This engraving of Ouessant, Seaweed Burners in 1898 (c 1898), probably by J Lavée, also shows the island of Ushant, and illustrates a book on the island by Paul Gruyer. Lucien Simon (1861–1945) The Chapel of Joy (1907), oil on canvas, dimensions not known, Musée des beaux-arts de Quimper, Quimper, France. Wikimedia Commons. Lucien Simon’s The Chapel of Joy (1907) shows a small church at Penmarc’h, Brittany, of Notre-Dame de la Joie, which was built in the fifteenth century on an ancient pagan site. In 1896 it was badly damaged during a storm, which flooded the church to a depth of 50 centimetres (eighteen inches). 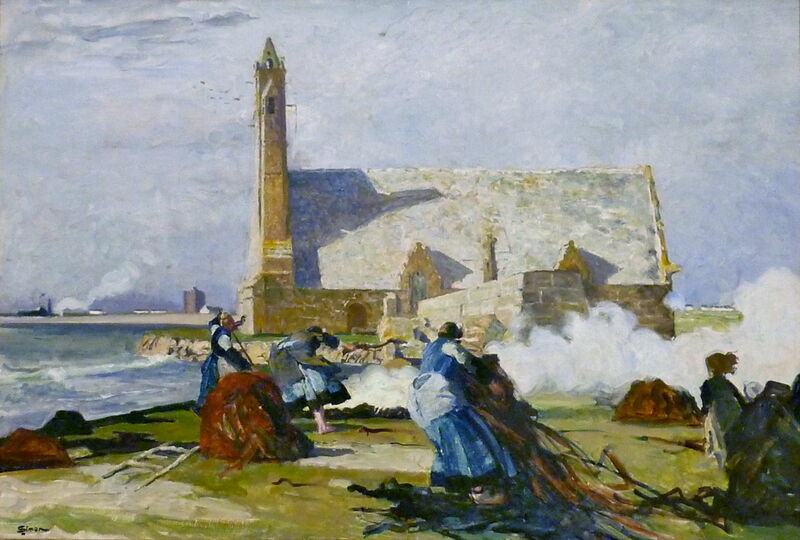 Despite the strong wind, a team of women is burning seaweed in the field next to the church. Eugène-Casimir Cadel (1862-1942), Seaweed Harvest, Raguenes (c 1900-10), media not known, 50 x 73 cm, location not known. Wikimedia Commons. Eugène-Casimir Cadel was another artist who painted at Pont-Aven. 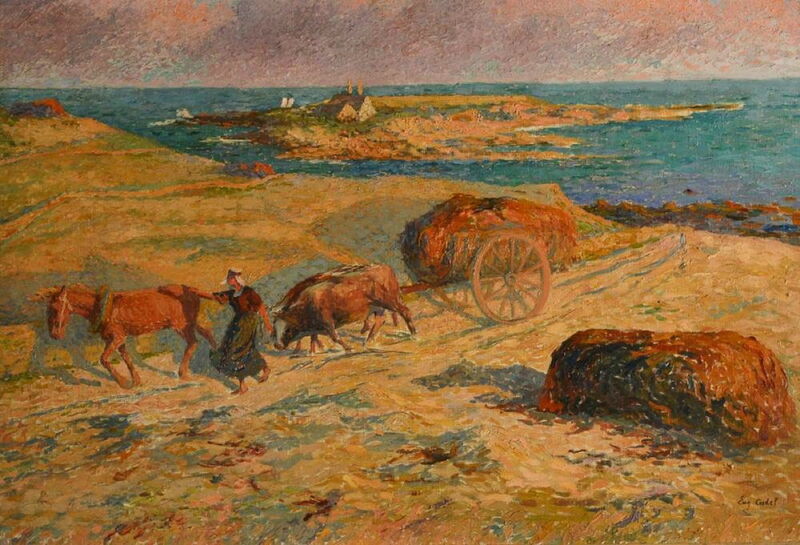 His Seaweed Harvest, Raguenes (c 1900-10) shows a cartful of seaweed being moved in a cart drawn by a horse and two oxen, from a beach to the south-west of Pont-Aven. The Czech artist Karel Špillar had lived in Paris and Normandy from 1902, and towards the end of his career painted in Brittany. 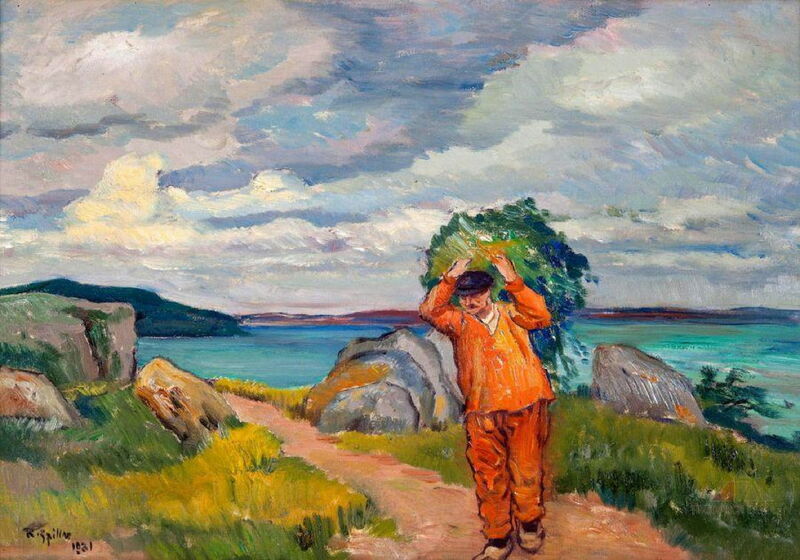 His painting of this Breton Fisherman with Seaweed on his Back (1931) is one of very few which depicts a man working in the seaweed industry, which was run almost entirely by the women, who did not go to sea to fish. Artists’ colonies in Brittany, such as that at Pont-Aven, ensured that its seaweed industry was well-recorded. In other coastal areas, such as those of Wales and the Outer Hebrides, it seem to have flourished then died in relative silence. There are a few paintings showing it elsewhere, though. Juan Martínez Abades (1862-1924), Gathering Seaweed on the Banks of the Berbés, Vigo (1892), oil on canvas, 40 x 76 cm, Museo Carmen Thyssen Málaga, Málaga, Spain. Wikimedia Commons. 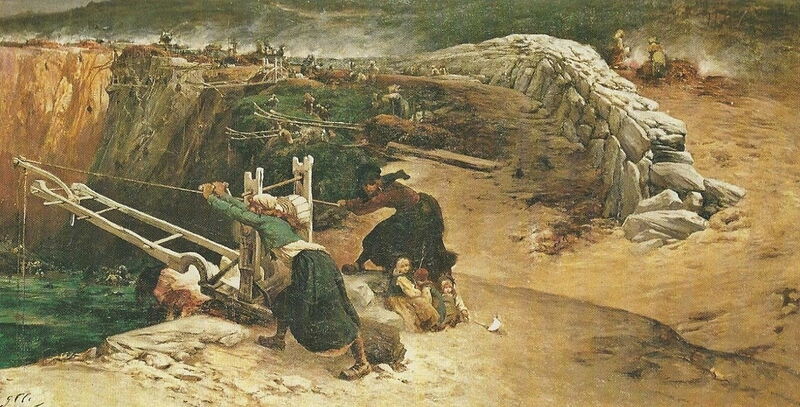 Juan Martínez Abades’ painting of Gathering Seaweed on the Banks of the Berbés, Vigo (1892) shows smaller-scale harvesting on the north-west coast of Spain, where seaweed was probably used as a fertiliser on the land. 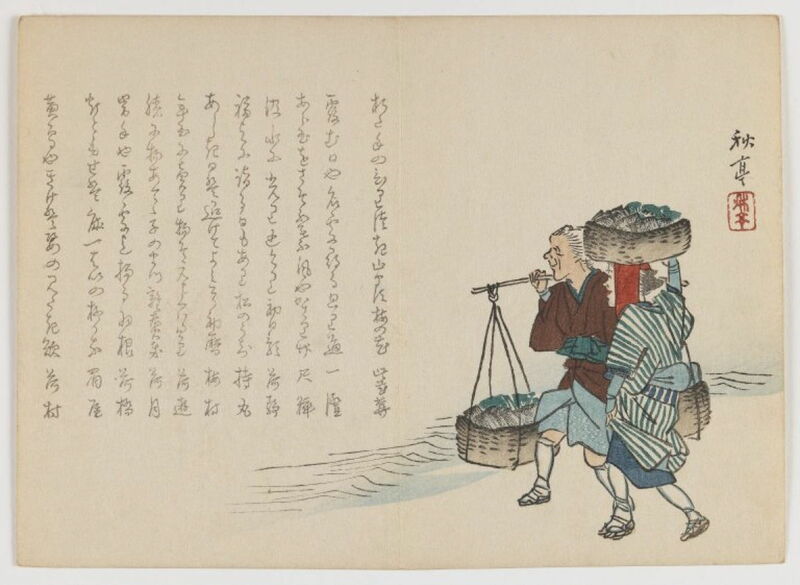 Shūtei Tanaka (1810–1858), Two Women at Water’s Edge Carrying Baskets of Seaweed (c 1860), woodblock print, horizontal Chûban yoko-e format, 17.9 × 25.1 cm, Brooklyn Museum, New York, NY. Wikimedia Commons. Finally, Shūtei Tanaka’s fine woodblock print of Two Women at Water’s Edge Carrying Baskets of Seaweed (c 1860) gives a glimpse of the industry in Japan. When you next tuck into some sushi and enjoy its fine wrap of Porphyra seaweed, spare a thought for those many generations of women who worked on the inclement coasts, lugging piles of cold, wet seaweed around, to try to feed their families. And the paintings which today remind us of their work. Posted in General, Language, Life, Painting and tagged Abades, Bernard, Butler, Cadel, Clairin, coast, Gauguin, Moret, painting, Philp, Pont-Aven, Schuffenecker, seaweed, Simon, Swift, Tanaka, Špillar. Bookmark the permalink. What a curious motif. I had no idea! Fascinating. I had no idea seaweed harvesting was so common. Thank you for sharing! Thank you. I thought that it might surprise! There are still some parts of the world which use seaweed as fertiliser, but that has greatly reduced now. Ironically, where it is produced for food – mainly for east Asian markets – or to process into derivatives like alginates, it seems now to be farmed.